Twin gear (triturating) juicers are monster juicers. These are the top-of-the-line, cream-of-the-crop juicing machines, extracting every drop of juice from the produce you put in them with the help of a twin gear interlocking technology that crushes everything to a very dry pulp. That's why twin gear juicers are also called triturating juicers. 'Triturating' involves crushing and grinding even the most stringy or light-weight produce into very fine particles. These juicers are slow – but thorough – and produce no heat and prevent oxidation in fresh juices. If you’re looking for the highest quality juices and have the money and time to dedicate to it, these are the juicers for you. ​Twin gear juicers are also super versatile and can juice pretty much every type of fruit and vegetable – including hard, fibrous veggies such as celery and apples, as well as soft fruits and leafy greens. Leafy greens in particular juice really well in these juicers thanks to the high pressure exerted by the interlocking gears. But they're not for everyone - to give you an idea of whether a twin gear juicer will be worth the investment for you, here's a quick look at the pros and cons of triturating juicers! Juice yield. Triturating juicers produce a super high juice yield – the highest of all the juicers – and very little pulp. Juice a huge range of produce. These juicers are really versatile and can juice pretty much every fruit and veggie you feed into it, including delicate sprouts, pulpy fruits, and tough fibrous veggies. Powerful extraction. Thanks to the interlocking twin gear action, these juicers are super powerful. It makes it really easy to juice trickier produce parts like watermelon rinds and guava seeds. Juice quality. Twin gear juicers don’t heat the juice and best preserve the maximum amount of nutrients. Multi-functional. Can perform a wide range of other functions, such as making pasta, rice cookies, and even bread sticks! Longer clean-up. Clean-up is not as easy due to the many different parts you have to clean. Price. These machines are pricey – starting at around $350 and going upwards into the thousands. Time-consuming. It takes some time to juice since these juicers have the slowest operation time among all the juicer types (which also means no heat = great for juice quality). You'll also have to cut up produce into smaller pieces before feeding it into the machine. Heavy. These machines are heavy-duty and easily weigh in at around 20 lbs. – not the ideal traveling companion. Not great for everything. They're not the best at juicing citrus fruits. FINAL NOTE: These juicers are the best. BUT – they might be overkill for the average juicer. Given the price of these juicers and the time investment that’s usually required to wait for them to juice and to clean them – I’d only recommend these juicers to people who are really serious about juicing and for whom the quality of the juice (and retaining maximum juice yield and quality) are a foremost concern. If you just want great juice everyday, opt for the more affordable single gear masticating juicer. If you juice religiously and want to transition into a raw foods sort of lifestyle and diet, then opt for a triturating juicer. Here are the best ones below! 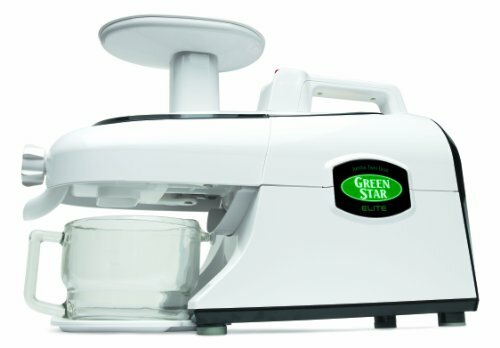 The Tribest Green Star is our top pick for triturating juicer for the simple fact that it is the best triturating juicer under $1000. It's also one of the best overall juicers. Ever.​ As they say, it is the only juicer you'll ever need. It does everything. It juices wheatgrass, sprouts, and all other leafy greens amazingly well. 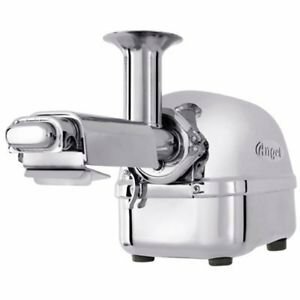 The only drawbacks to this machine is the price ($550 on Amazon - still less than half the price of the Super Angel juicer below) and the fact that although it's advertised as one of the easiest juicers to clean, it does take longer to clean than, say, manual or masticating juicers. All the detachable parts are easily removed for cleaning, but there are simply more parts and thus takes longer. But overall, the Green Star produces extremely high juice yield of the best quality juice. If you're looking for the best value triturating juicer - this is it. The Super Angel is most often referred to as "the Rolls Royce of Juicers." And it's a fitting nickname considering this triturating juicer is beautiful to look at and is great at what it does - with a price tag to match. But the reason we list it as #2 is that much like a Rolls Royce - the Super Angel is not for everyone. Is it stunning to display on your countertop? Yes, this all-stainless-steel beauty will be the highlight of your kitchen. Is it amazing at juicing? 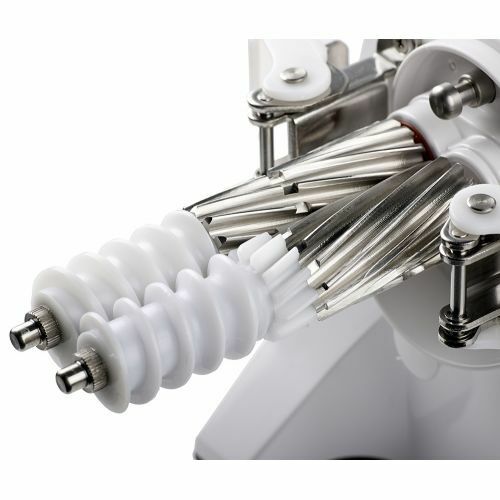 YES, this triturating baby possesses twin gears that rotate at a low 86 RPM and is designed to extract the most juice from even the most delicate greens like herbs and sprouts while preserving all enzymes and nutrients alive in the juice. 'Cause to be honest, the Super Angel is a very top of the line juicer. You can tell immediately as soon as you extract your first juice. The colors are richer, the pulp comes out bone dry and whittled down to practically nothing, and there is no foam, froth and very little pulp. And the motor doesn't flinch even when met with the stringiest of greens. But not everyone needs a Rolls Royce (of juicers), especially if you're just looking for a quicker, more affordable juicer with very high juice quality. In that case, the Green Star does a comparable job - at half the price. What the Green Star (or most other juicers) don't do, however, is come in stainless steel. This might seem like a vanity factor, but if you're juicing several times a day - this becomes crucial. Both for how your juicer holds up and how easy it is to clean (stainless steel doesn't stain).